How to even write about today? It’s daunting. The mileage between us and Yuma (and available campsites in between) stays just out of reach, so we decided to break up the day into 2 and continue to commute back to our hotel for sleeping. It means we can slackpack and still have time at night for the copious internet chores that take up so much of our town time. And maybe sneak in a beer or two and some TV time! We slept in a little longer than usual and took a Lyft back to the last spot we’d left off hiking in downtown Calexico. Walking along the canal had treated us so well before and we decided to find it again. It disappeared for a bit, veering off to the north, so we walked along a road that paralleled the fence. We noted that the road was 1st St and it disappeared only to show up on the Mexico side. The roads do not end at the wall, the pavement just continues on into Mexico, which is not practical since there’s a giant wall running through it. For the first time on this trip, we saw a residential area on the American side smushed up against the border. We were walking on a sidewalk, along a road, with traffic and houses, the fence only 10 feet away, and an equally busy street with houses just on the other side of the fence. Maybe a little farther away than your neighbors across the street, but just barely. At one point, a man manicuring the adjacent streets in Mexico stopped what he was doing as we walked by. When Tenny stopped to wave, his perplexed expression was instantly replaced by both a grin and an enthusiastic gesture back. It gave us a boost to feel that connection through the wall. It’s so easy to feel distrustful of strangers out here but then we get that moment where we feel like we’re all the same. How do we practice constant safety, yet maintain faith in others? The residential area lasted only ½ a mile or so, before abruptly transitioning back to the crop fields we’d walked along the entire way into town. Immediately the roads turned to dirt. Mexicali - the city immediately across the border, is a far larger urban sprawl, and the residential streets and traffic continued for as long as we hiked today, with no discernible end. Calexico, and much of Imperial Valley, is laid out in a grid pattern, with I-8 about 15 miles north of the border and Hwy 98 about a mile from the border. Everything in between is a patchwork quilt of perfectly aligned agricultural squares, with small segments set aside for human habitation. 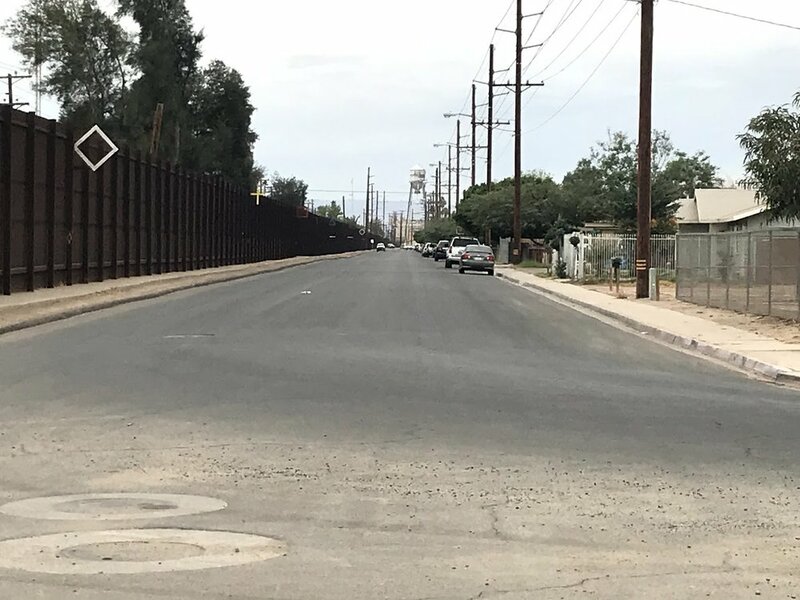 This is not an area where people live far apart; from what we could see, almost all the space in a 15-20 mile radius of the border was allocated to crop fields. There’s a lot going on with all this, as we were to learn later in the day. After a couple miles, we rejoined the canal, which had grown in size since we’d last seen it on the western edge of town. As we walked, we noticed a heavy helicopter presence, mostly flying right above the border wall. We couldn’t quite make out the insignia on the plane, but we gathered they were some branch of Border Patrol. They looped back when they saw us and dropped, flying by our heads maybe 15 feet away. Did we pass the test? Since they continued on without further contact. No border patrol made any attempt to talk with us today, so they either know who we are or don’t care, as long as we stay away from the fence. We easily made it to our target for the day, a border crossing just east of Calexico that we’ll return to the following day. We had plans to meet John Hernandez, who collaborates with the Border Angels community and is a lifelong activist for the Imperial Valley. 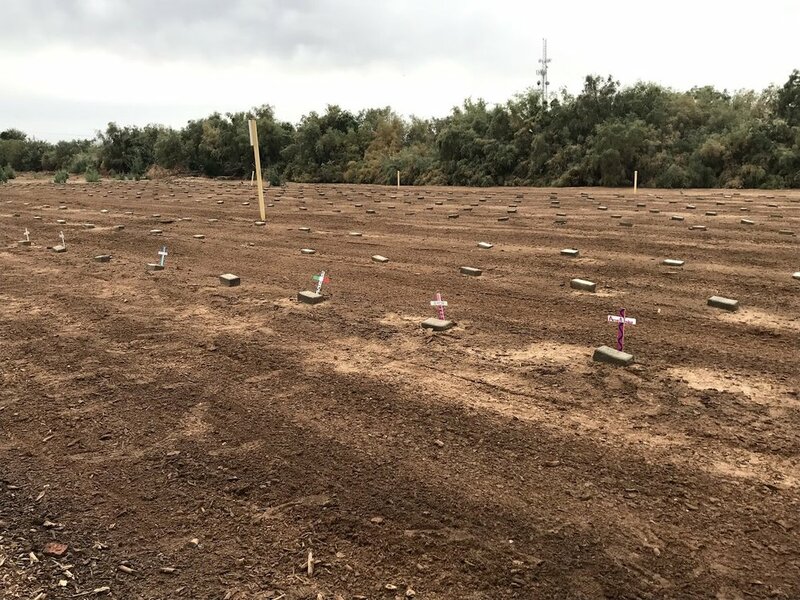 We were extremely fortunate that he agreed to guide us through Terrace Park Cemetery, just outside Holtville, where Imperial County used to bury the remains of unidentified migrants. The cemetery was not within walking distance, so we called another Lyft to pick us up. It’s strange for us to have such constant mingling of the low tech trail world and the high-tech city life. Calling a Lyft from the trail! Crazy. Our Lyft dropped us off (after helping us brush up on some of our Spanish vocab!) and we met John in the parking lot. We’d both spoken with him on the phone, but we’d never met in person. At once it is obvious how special he is, a truly remarkable person. He’s lived in the Imperial Valley his entire life, and has a long and impressive history with activism that is not limited to any one subject. He has served on the board of several not-for-profits in Imperial County which work with migrant deportation and has extensive knowledge on the power dynamics and economics of the Imperial Valley. In our short time with him, we only scratched the surface of his commentary. This is a fascinating area, with some crazy and convoluted stuff going on. We need another 6 months just to get through some of this! John had brought 2 friends and fellow activists, a married couple named David and Anita. David had migrated to the US from the UK, and Anita had done the same from Ecuador. Both were fascinating, intelligent people, with their own sharp commentary on many of the same issues John was so passionate about. Between the three of them, we got an education. Although the cemetery is owned by the county and considered public land, the access to the back part where the unidentified remains are buried is restricted. John and Enrique, the founder of Border Angels, both know the guy in charge, so we were able to get in with John. Apparently, the back lot is dangerous, and that’s why it’s not open to the public, but it felt more like they just didn’t want anyone monitoring the area and keeping track of the burials. This is how we value migrants, even when they’re dead, as John reminded us. We left the main part of the cemetery and exited a small area in the back to a deserted empty lot of dirt, and a sprawling trash heap. 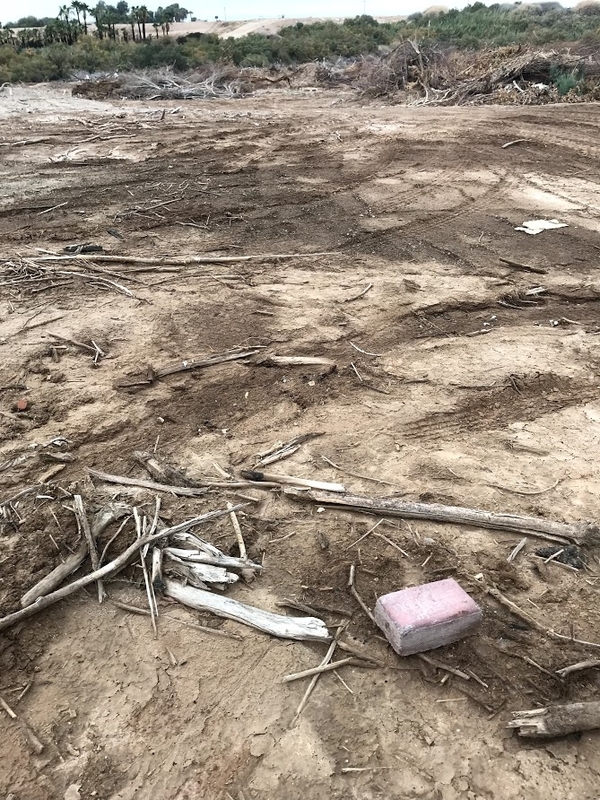 According to John, up until 2009 the county buried any unidentified remains found in the desert in this dirt lot behind the cemetery. It was also a pauper’s grave, for those who couldn’t afford anything different. In the place of headstones, the graves had a uniform stone, about the size of a brick, with the row and column number and a name, usually John Doe, chiseled on the top. How can this be so crude? Supposedly, the dirt is unstable so we could only approach the first row of markers from the path. Border Angels comes every month to leave crosses and other offerings along this first row. No one else really visits, and the remains will just stay here, unidentified and forgotten, in rows too short and packed together to accommodate a human body. John and Anita both talked about remembering a time when the rows stretched out much further, and they say much of the area has been bulldozed over in the years since. In the back of the lot, we found a couple markers and crosses, tossed in the trash heap. Grave markers found in a trash heap out back. Although the cemetery set a somber tone, our three companions had a lot of strength and hope to offer as they shared some of their stories. Imperial Valley functions like a sink; it’s surrounded by elevated areas on all sides (the Sierra Madres, the Chocolate Mountains) and the water that is funneled in settles in the middle of this low lying area. Long ago, the powers that be decided that this would be a perfect agricultural area, and built the canals that wind their way through the valley, diverting water from the Colorado River to feed a massive agricultural operation. 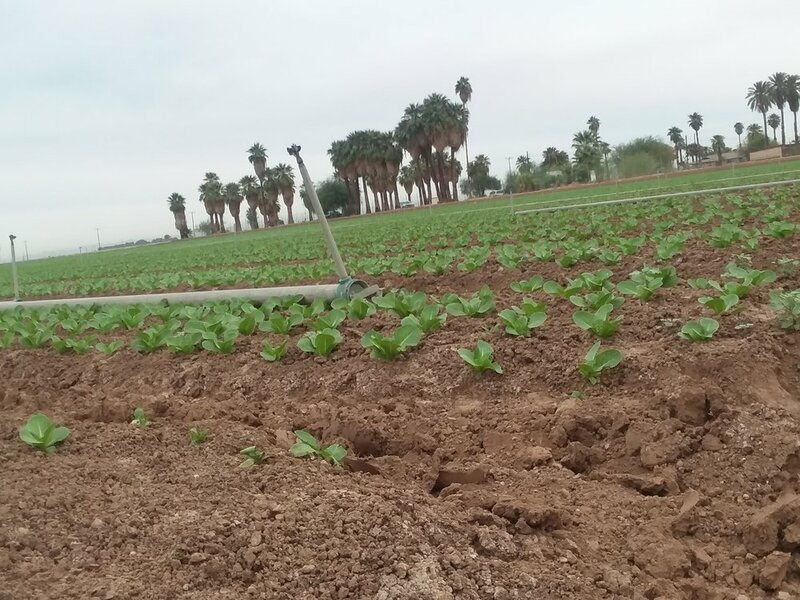 John estimates the agricultural industry in Imperial Valley to be a 2.2 billion dollar industry, and easily the major power player in the area. Problem is, almost all of this money leaves the valley and goes into the pockets of the handful of individuals and corporations that own the vast swathes of crop land. 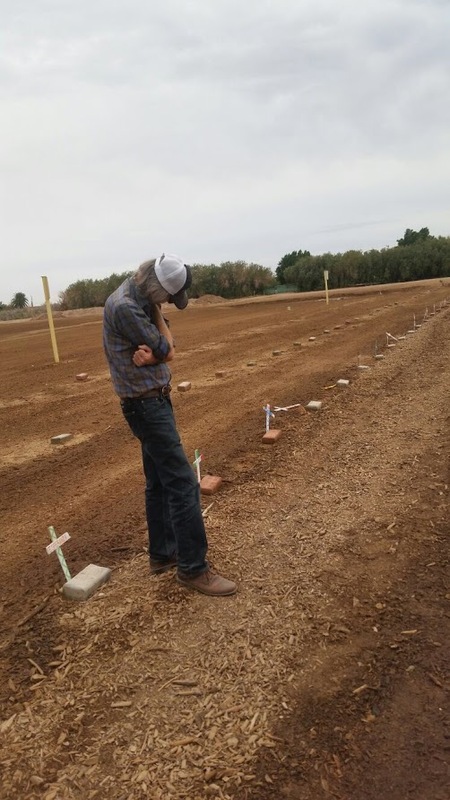 A 40 acre plot can generate $1 million per crop cycle, and with California’s constant sun and mild weather, a plot can rotate through 3 crop cycles per year, with time in between given over to sheep and other livestock grazing. Because Mexico is so close, it’s cheaper to hire laborers that commute into America by day, and return to Mexico at night. Many of the crops, hay being a major one, are immediately exported overseas, to Japan and other parts of Asia. Meanwhile, a complex system of toxins and pollutants enter the soil, the crop, and the water supply, with no one taking responsibility at any level. California law mandates that any water designated for the use of drinking must be regulated and screened to a certain level of safety. However, given the original mandate of the canals, all of the water rushing through the valley is officially designated to irrigation. All the corporations have to do is claim their water is not for drinking and tell people not to drink it. And that’s the extent of their responsibility. For the very poor living in this area, many of them migrants and day laborers, safe and clean drinking water is not an option. We've linked this article from John’s Facebook to further explain the problem. This place is literally poisoning people. Add on an intensely militarized presence from both the border patrol and the many Air Force bases in the area, and you begin to see how this steady disempowerment functions. David, who just retired, spent his career working as a translator for the federal court in the area. According to him, this area is one of the most popular places to smuggle drugs across the border. The big money is in meth now that the US has cracked down on domestic production. The raw ingredients come from China and are processed in Mexico then moved across the border. A kilo of meth (which is a whole heck of a lot) will sell for $2,000 in Mexico, $4,000 in Calexico, and over $8,000 in LA or New York. With that kind of money, and the high level of poverty on both sides of the border, it is almost impossible to staunch the flow of drugs into the country. And yet, the US continues to throw vast sums of money into the War on Drugs, making this industry even more profitable. 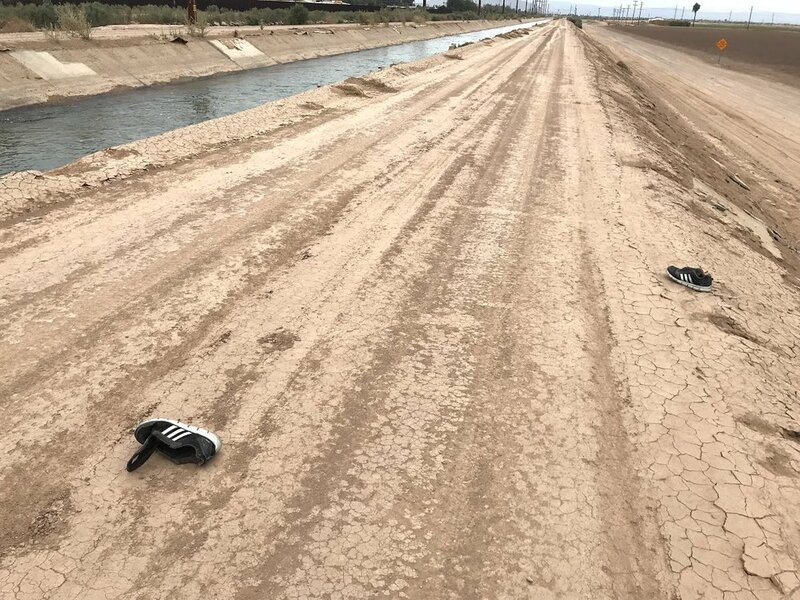 Imperial Valley has one of the busiest federal courts in the country, whose case work is almost entirely made up of small fish drug smugglers and migrants who are caught and shipped off to federal prison to serve their 10 years. Despite the seemingly insurmountable battle of all this money and power, John, Anita and David continue to fight and have hope. And they see changes for the better. Anita spoke at length about the power women will bring to the table as we continue to organize and gain agency. A different kind of power than what we’re accustomed to. Not power over people, but power with people. Using the community and our connections to each other to organize and restructure our system. Finding a way to preserve our individual self, while recognizing how we fit into part of a larger whole. Preach, sister. This is what it’s all about. There’s so much to say it seems impossible to write it all down. This is an area we’ll be back to. So much going on for such a small piece of the border. We’re tremendously grateful to John, Anita and David for pouring so much of their energy into this area, and for sharing with us. It's inspiring to see the example they set, but it’s also a sobering responsibility that has now been shared with us. Suffice to say, this is an area and a conversation that will stick with us for a very long time, and will require a lot more time and reflection. Sorry for not being better able to represent everything that is going on but we'll keep learning and thinking about this area.